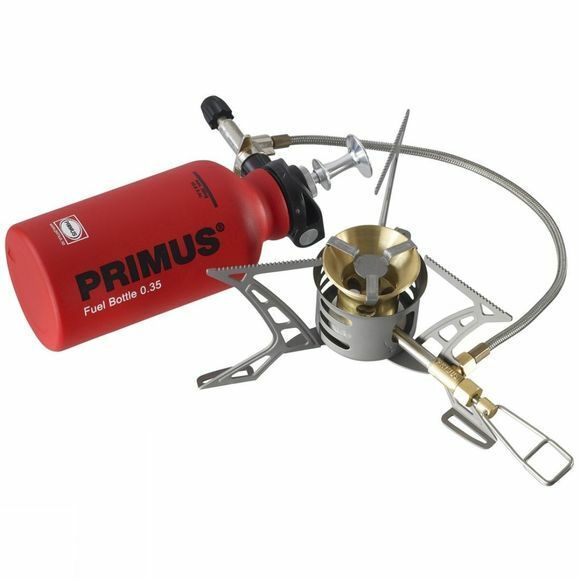 The most advanced Primus stove ever OmniLite Ti is based on the same technology as their award-winning OmniFuelâ„¢. This stove is just as reliable and robust, but smaller, lighter and much more fuel-efficient. Its output has been adapted for the new generation of fuel-efficient pots with a heat exchanger, like our Eta Potsâ„¢. The stove body and pot supports are made of titanium, making the stove very stable and light. OmniLite Ti works with butane, gasoline/petrol, diesel, kerosene/paraffin, and even aviation fuel. Using the separate control knob, you can adjust the flame to the heat you want, even if you are wearing gloves. The pack size is minimal and the stove is perfect for one or two eco-conscious people heading out on an adventure. ErgoPumpâ„¢, a multi-tool with a cleaning needle, a foldable windscreen, a heat reflector, a 0.35 l fuel bottle and a convenient and durable storage bag are included.